A team of Nizhny Novgorod researchers led by Dr. V.A. Vodeneev, head of the Laboratory for Optical Theranostics at the Institute of Biology and Biomedicine of the Lobachevsky University (UNN), is working to develop effective ways to combat cancer. Currently, much attention is given to photodynamic therapy (PDT) of tumors, a method of treatment based on the accumulation of photosensitive substances (photosensitizers) in the tumor. When these photosensitizers absorb light at a certain wavelength, they can generate toxic agents that kill cancer cells. Researchers' efforts are aimed at developing methods for targeted delivery of drugs to target cells. By solving this problem, it will be possible to minimize the impact on the surrounding normal tissues, reduce systemic effects, and achieve the maximum effectiveness of photodynamic therapy due to the specific accumulation of drugs in the affected tissue. Preparations for PDT being developed at the UNN Laboratory for Optical Theranostics belong to the porphyrazine class. In 2015, a group of scientists from the London Imperial College (Department of Chemistry, Imperial College London, Exhibition Road, London SW7 2AZ, United Kingdom), together with researchers from the Lobachevsky University and the Institute of Organometallic Chemistry of the RAS (Nizhny Novgorod, Russia) proved the unique possibility of their double use as photosensitizers and viscosity markers in photodynamic therapy. Intracellular viscosity measurement is very important for monitoring the effectiveness of photodynamic therapy. It allows one to evaluate structural changes at the cellular level (since cell death during therapy is accompanied by an increase in intracellular viscosity). These results were published in the Journal of Materials Chemistry [Izquierdo M.A., Vyšniauskas A., Lermontova S.A. et al. (2015). Dual use of porphyrazines as sensitizers and viscosity markers in photodynamic therapy. Journal of Materials Chemistry B 3:1089-1096]. 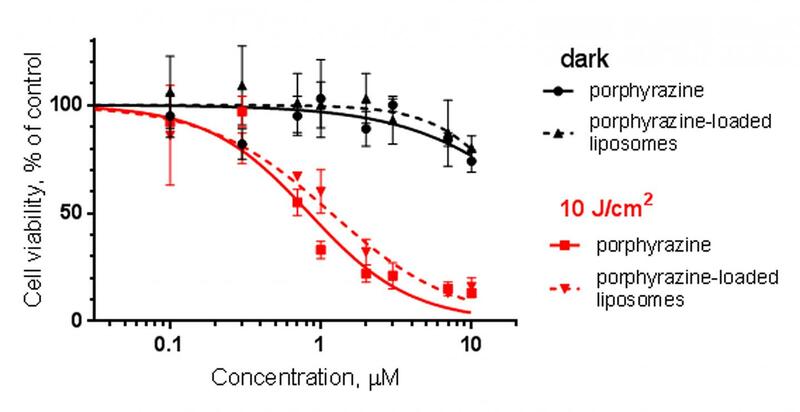 Nizhny Novgorod researchers propose to increase the effectiveness of these photosensitizers by loading them into special lipid capsules – liposomes. Scientists claim that liposomes will ensure effective delivery of the photosensitizer to the affected area due to the structural features of the tumor vasculature. In this case, it will be also possible to reduce systemic toxicity of anti-cancer agents. According to Dr. Vodeneev, the studies carried out at the UNN Laboratory for Optical Theranostics show that the porphyrazine photosensitizer can be effectively loaded into liposomes consisting of phosphatidylcholine and its mixtures with cholesterol and phosphatidylglycerol. "We have achieved a high rate of cellular uptake of the liposomal preparation and a strong photoinduced toxicity. This provides the prerequisites for the further use of the liposomal form of this photosensitizer for photodynamic therapy of tumors", notes Dr. Vodeneev.